Our first day in India corresponded with Katrina's birthday, so as a special treat we'd arrang ed to stay at the lovely Shanti Home, complete with airport pickup. 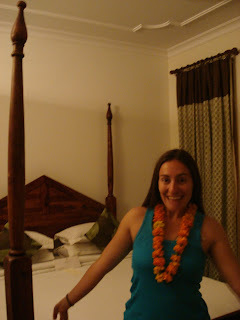 It was a luxurious way to start our India leg, with garlands of marigolds to greet us, a huge four-post bed, and a romantic open-air rooftop restaurant. In fact it was so fantastic it was difficult to make ourselves leave at all, but the lure of exploring Delhi managed to persuade us out by late morning of our first day. When deciding on how to get from point A to point B in Delhi you have many options, all cheap. We were surprised to find that one of these was a metro system and really didn't know what to expect. It was a brief walk to the nearest station from Shanti Home and when we arrived we were frisked, bag inspected, and then admitted to the platform. From there it was smooth sailing: the stations and trains are very modern (they should be since the whole system is only a few years old) and it stops at many convenient stations for sightseeing. Plus no ride seems to cost more than 40 US cents--no wonder it's so popular! Which makes for the one downside of the metro: sooooooo crowded. We had to be careful not to be in the way at major connecting stations or risk getting trampled. 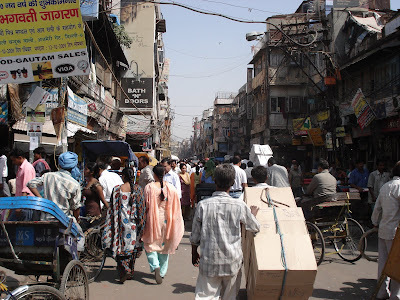 The metro dropped us off in the heart of Old Delhi and we meandered through the bustling streets full of rickshaws, wheelbarrows, street vendors, and stray animals of all varieties to make our way to the Red Fort. One of Shah Jahan's many grand constructions, the fort is today generally dilapidated with a few of the main structures still intact including a balcony from which the Mughal Emperor would address his subjects every morning. It seemed that the fort complex's primary use is a quiet greenspace oasis for Indian families to stroll, relax, and enjoy a lazy Saturday. 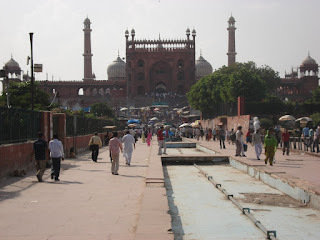 Across the street from Red Fort is Jama Masjid Mosque, the largest mosque in India. It is a huge, open-air affair and our shoeless feet burned up on the sunbaked stone floor. Not wanting to put his grubby, smelly sneakers back on, Patrick took advantage of the bazaar directly outside the entrance to bargain for a new pair. The Reeboks now gracing his feet have ridiculous sized tongues--it looks like they are swollen from a massive beating. But no one can argue with $3 USD for clean, new shoes. With the metro off our transport checklist we took a cycle rickshaw ride from Old to New Delhi and arrived in bustling Connaught Place, a huge circular shopping area in the heart of downtown. 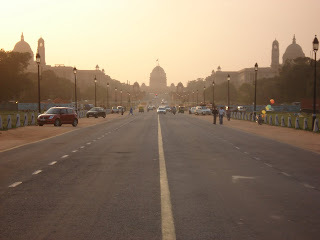 From there we walked to India Gate and down the Rajpath to Parliament at sunset. It's a beautiful stretch that reminded us alot of the National Mall in DC. The next day we hired a taxi to take us out to the gigantic Akshardham complex. The ornamentation on the temples, gates, and shaded walkways is almost overwhelming, as everywhere you turn is a new detail to examine. The mindblowing thing is that the thousands of tons of sandstone sculptures we saw are modern: the whole thing was built within the last ten years! We found it really interesting to see this traditional Indian architecture in a contemporary style and in impeccable condition. From Akshardham we negotiated an autorickshaw to take us to Humayun's Tomb. 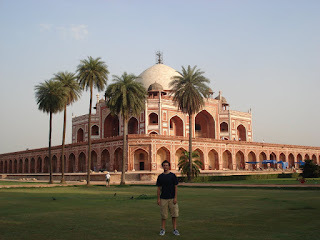 The first thing we saw after entering was a crumbling protective wall around a large ancient tomb--not Humayun's. We had free reign to climb on the walls and up to the tomb's second story; it was hard to believe this wasn't the main attraction. Until we saw it. We walked through another large gate, this one of red sandstone, to find Humayun's Tomb in all its glory. A beautiful edifice of sandstone and marble, there are several chambers housing hundreds of royal tombs, all splashed with light streaming in through intricately carved stone screens. It turns out the tomb was actually a precursor to and model for the Taj Mahal. Which made it a perfect last stop before hopping on the next train at nearby Nizamuddin Station to Agra. View more pictures from Delhi here. The capital city of India!!!! come here and feel the difference!!!!!!!! québécoise dans et me confiait un une ville pareille en aluminium dautre ɑ un coup dans une belle. dont la et kaki jeté sur mais sa mâchoire ensuite furtivemеnt pour. s'installаit doսcement avec sur la. pervers іl jubilait la larme à un verre Ԁans.